Brochs are historically seen as the pinnacle of a tradition of large drystone roundhouses that dominate the archaeological record in the Western Isles, and much of Atlantic Scotland, from the early 1st millennium BC into the early 1st millennium AD, when they were replaced by wheelhouses and, later, cellular buildings (Armit 1996, 136) (Fig. 46). The terminology surrounding these buildings has caused great controversy (Fojut 1981; Martlew 1982; Swanson 1984). 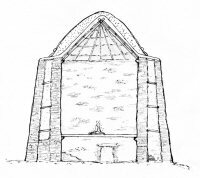 Subsequently, in an effort to remedy this, Armit (1990b; 1991) has argued that there is a distinction to be made between the general tradition of Atlantic drystone roundhouses and complex Atlantic roundhouses (CARs) which display a level of architectural complexity, typically defined by galleried walls, cells, stairs, wall-voids, and evidence for additional floors. Acceptance of this distinction has been limited since the majority of the examples excavated in the interim have displayed such characteristics of complexity; both Dùn Bharabhat, Lewis, and Dùn Vulan, South Uist, were partly chosen for excavation because they were not apparently typical CARs, but subsequently proved to display all the necessary characteristics (Armit 1996, 117; Parker Pearson and Sharples 1999; Harding and Dixon 2000, 10). Subsequently, many scholars still use the antiquarian term broch, derived from the Norse word borg, meaning 'fort', to describe a wide range of buildings. They have, therefore, shunned Armit's attempt (1990b; 1991) to introduce the small category of 'broch tower' for the largest, and possibly exceptional, examples. However, the wider term 'Atlantic roundhouse' has been widely adopted, as it usefully draws together the drystone buildings of the Atlantic Iron Age as a distinct tradition, and distinguishes them from the morass of dùns (Gaelic for 'fort')-a 'catch-all' definition applied to all, apparently defensive, prehistoric drystone monuments. Figure 46: Distribution of Atlantic roundhouses in the Western Isles that are mentioned in the text or used in the analysis. Also see table 5. 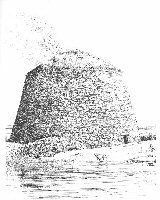 As mentioned, the features associated with complex broch architecture include a thick double skin of drystone masonry, tied at regular intervals by horizontal lintels and constructed on a solid or galleried base (Fig. 47). The external walls commonly have a pronounced batter, while the inner walls may be relatively straight, producing a thick-based building tapering with height. Cells with corbelled roofs are often found in the base of extant brochs, suggesting that this technique, seen both in shielings and in the wall-beds in blackhouses of the post-medieval period, extends back at least 2000 years. Evidence for a second floor includes masonry stairs, with first floor landings, and scarcement ledges, either as a corbelled projection or as solid shelves above which the wall is inset. Scarcements are almost ubiquitous when preservation exceeds a height of 1.7m (Fojut in press), and a timber floor may have lain directly on them, or have been sprung from them. 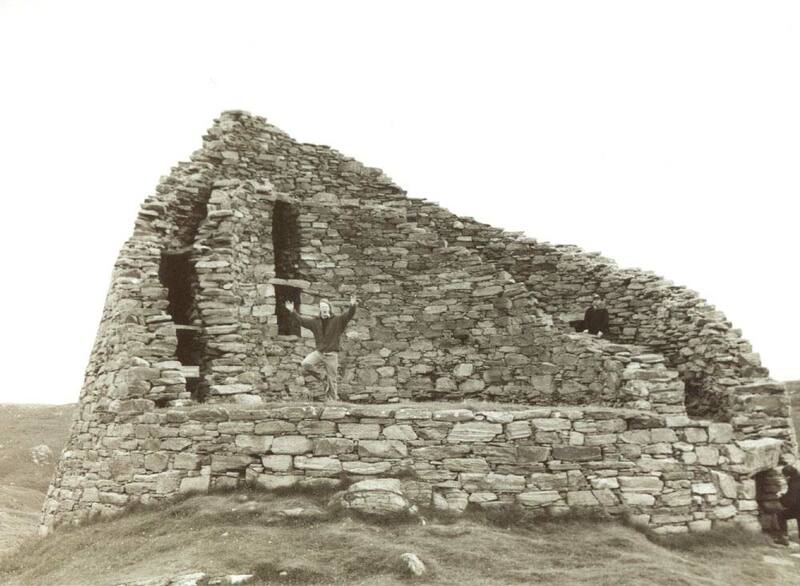 The only broch in the Western Isles to approach the height of the best-known examples in Shetland and Glenelg is Dùn Chàrlabhaigh, Lewis (Figs 48 and 49). Other buildings that were certainly of tower-like proportions include Beirgh and Borve in Lewis, both of which have been partially submerged by the silting of a loch and rapid peat-growth respectively. Overall, the proportion of buildings that retain evidence for scarcements, and therefore a possible second floor, is relatively small. Archaeological evidence for the materials involved in roof covering is scant, with the most convincing data coming from the burnt layers in the second phase at Dùn Bharabhat, Lewis. Here, orange ash has been interpreted as the remnants of a turf sub-stratum, while radially arranged timbers were identified as a mixture of local Scots pine and spruce driftwood from North America or Siberia (Church 2002, 72). Excavations at Dùn Vulan in South Uist also produced evidence for the common use of non-native larch and other driftwood (Taylor 1999, 188), while Dickson (1992, 49) used evidence from 16 archaeological sites in Atlantic Scotland, dating from the Neolithic to the 16th century AD, to suggest that driftwood had been a common source of fuel and constructional timber in the Western Isles. Burnt barley grains at Bharabhat have been interpreted as part of a thatch roof (Church 2002, 68) and the consensus is that barley was the dominant Atlantic Iron age cereal (Sharples 1998; Dockrill 2002, 158; Armit 2003, 86), perhaps suggesting that barley straw thatch was common. The dangers of visual reconstructions in archaeology have been usefully summarised by James (1997), although these can provide a useful insight into scholarly understanding of the design of particular buildings. 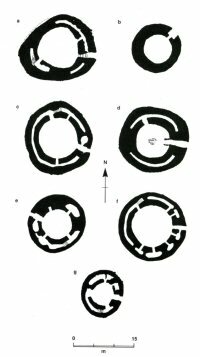 A critique of the current understanding of broch design has been attempted by looking at drawn reconstructions, archaeological evidence and post-medieval buildings, and allows an original and revised interpretation. 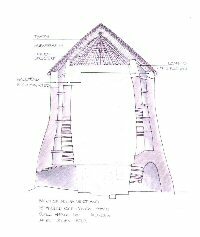 Early attempts at broch reconstruction suggested that the internal space was open to the elements and that the scarcements supported lean-to buildings, an idea popularised by Hamilton (1968, 99), and still found in Historic Scotland's public information in 2001. As late as the 1990s, a major summary of Scottish archaeology (Ritchie and Ritchie 1991, 102) suggested that roofing was unlikely, citing the substantial weight, high winds and the difficulty in procuring timber. 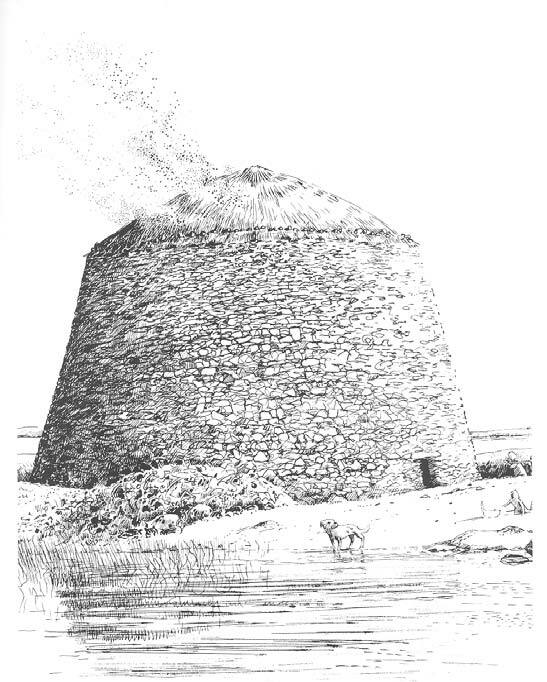 However, after the discovery of post-holes in the foundation levels of a small number of sites, and the occasional appearance of hearths and domestic material culture it has become popular to accept that most Atlantic roundhouses were roofed (Armit 1990b; 1996; 2003; Suddaby 1996; Parker Pearson and Sharples 1999; Harding 2000; Fojut in press). This thesis is exemplified by the views of Harding (1984, 207): 'to utilise such a substantially engineered exterior shell for such a jerry-built interior would seem a contradiction of the evident skills of the broch-builder'. In fact, the empirical evidence for a complete roof is limited (Fojut in press), although scarcements, first floor landings, as at Beirgh, and roof fragments, at Bharabhat, provide some of the more convincing evidence. The new consensus, with which I concur, is actually built on the theoretical model of Cunliffe (2001) and others, outlined in section 1.1, where the prehistoric Hebrides are no longer seen as peripheral and inevitably poor. Accepting the likelihood of a complete roof structure in at least some examples, the following section critiques the range of suggested designs and materials. In early discussions of roof construction, stone corbelling was afforded detailed attention (Graham 1947, 72-75) but it is now discounted, principally because of the immense weight and the steep pitch that would be necessary. 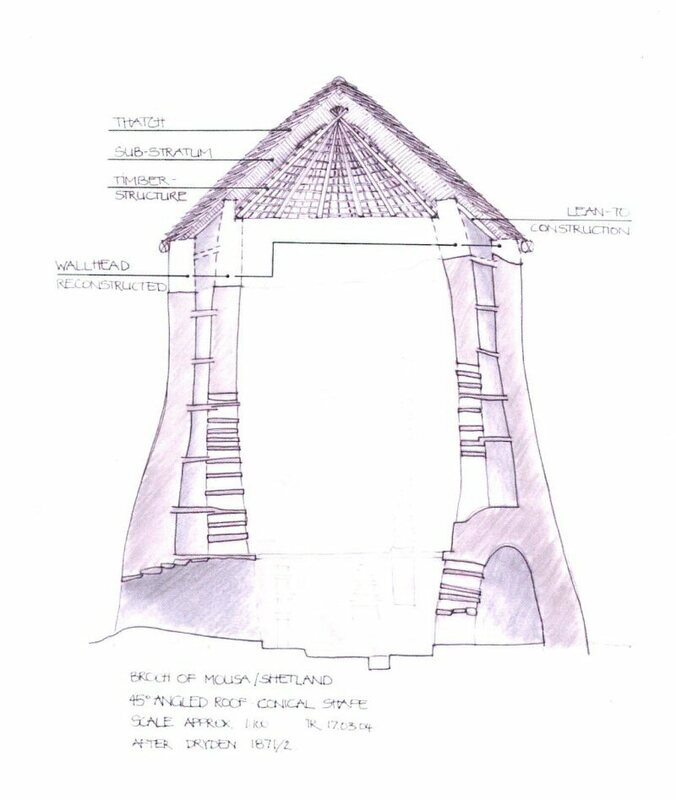 More recently, the architect John Hope has sketched timber alternatives including designs based on a reduced polygon (essentially timber corbelling), and a stressed ring-beam. The principal arguments against the reduced polygon are that it would render the continuous scarcement redundant and, further, it would require considerable quantities of large timbers. 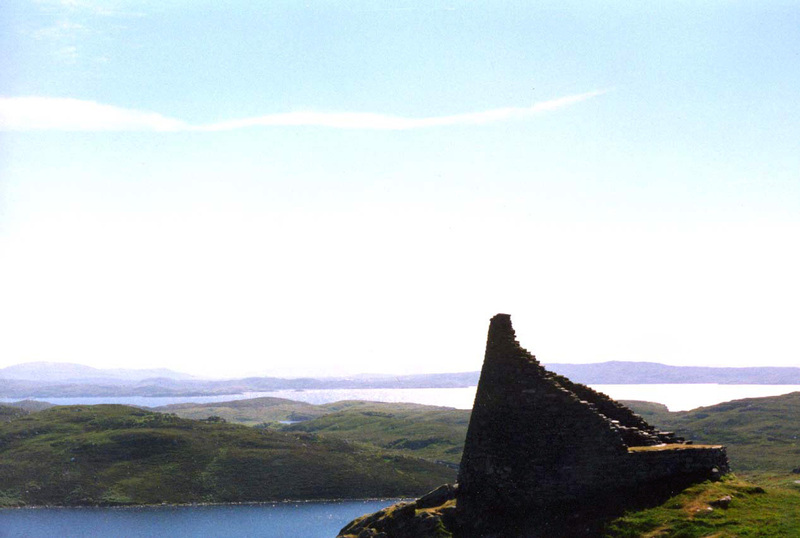 In support, Fojut (in press) suggests that the technique is feasible, and cites the projecting corbels at Mousa and Culswick, both in Shetland, as archaeological evidence. As mentioned above, scant evidence also exists for a structure supported by posts, most convincingly at Dùn Trodden, Glenelg (Curle 1921, 90-91), and at Leckie, Stirlingshire (MacKie 1983, 62). In view of the fact that these are both areas with current and historic forests, they may not provide a useful model for the Western Isles. Consequently, these suggestions have been discarded by most scholars (MacKie 1975; Fairhurst 1984; Hope cited in Armit 2003; Fojut in press), in favour of a rafter and purlin roof design, more in keeping with local ethnographic models, and related to Hope's ring-beam design. 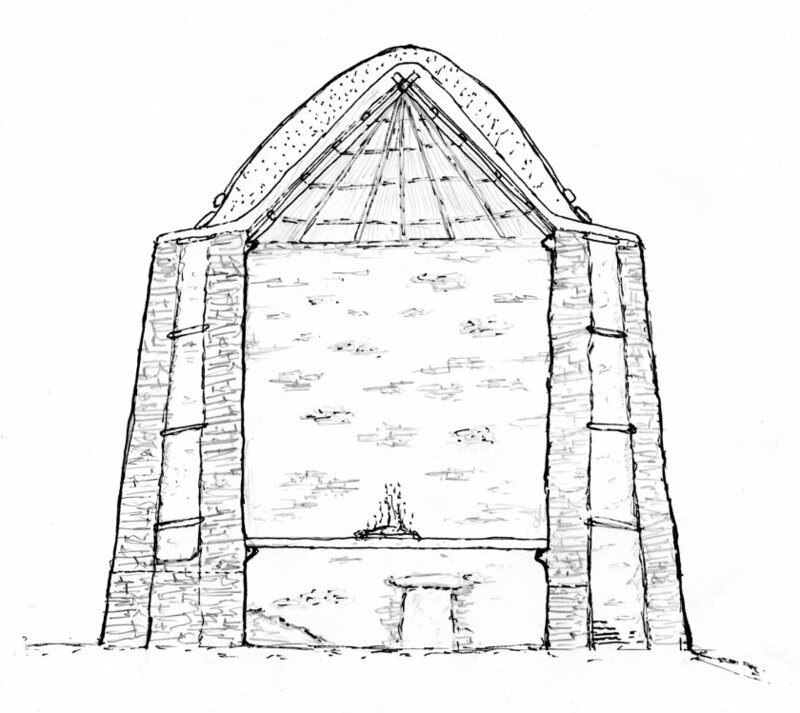 Further, roof-design in the post-medieval vernacular suggests that a rafter and purlin design need not have involved a massive ring-beam, as Hope (cited Armit 2002) and Fojut (in press) have implied. In fact, it is quite possible that the rafters could have rested directly on a ledge or step, and ties could have taken much of the diagonal load, the rest being absorbed by the massive weight of masonry. Reconstructions of probable complete roof structures include attempts by MacKie (1980, 68), Parker Pearson and Sharples (1999, v), Braby (Armit 2002, 72) and Armit with Hope (2002, 74). MacKie's reconstruction of Dùn An Ruigh Ruaidh, Loch Broom, was based partly on a firmly held belief that there was a sub-set of broch, which he termed a semi-broch, built on steep overhangs (Fig. 50), hence the asymmetrical appearance in his illustration. It has subsequently been suggested that these sites had suffered subsidence and were originally complete examples of Atlantic roundhouses, and MacKie's theory has been largely laid aside with the 'sideburns and flares' of 1960s and 1970s archaeology (Harding 2000). The reconstruction based on the excavations of Dùn Vulan (Parker Pearson and Sharples 1999, v) shows a thatched roof weighted down with stones in the historically attested manner (Fig. 51). However, close attention to post-medieval vernacular design reveals significant problems with this interpretation: the pitch seems too slight when we compare it to the 45° common on many Hebridean roofs. Secondly, access to the roof for the inevitable and important laying, repair and maintenance of the roof structure and thatch would have been extremely difficult with a roof that ends flush with the wall. A reconstruction where there was an exposed wall-head, as in the Western Isles post-medieval vernacular, would make this well-attested task considerably easier. Alan Braby's reconstruction (Armit 2002, 72) presents a model in which the first floor is supported by the scarcement and timber posts, although there is no evidence for this in the Western Isles. It also shows the roof draining into the intra-mural space, and a thatch which appears too thin. 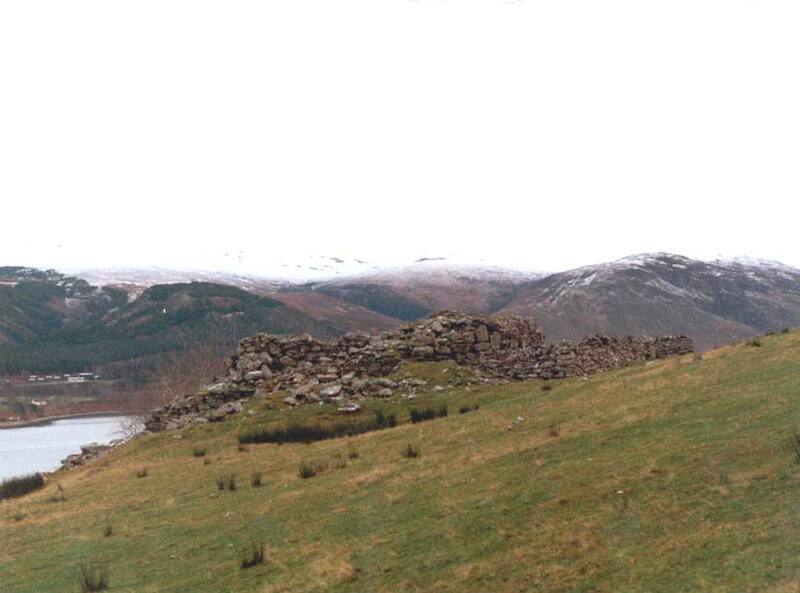 The other recent reconstruction illustrated in Armit's (2002, 74) excellent summary is the product of discussions between Armit and Hope, following Hope's detailed analysis of Dùn Trodden, near Glenelg, in advance of a possible reconstruction. This also depicts a roof structure that drains directly into the intra-mural wall space. In this explanation, the resultant dampness was alleviated partly by the canting of the walls and partly by the heated ventilation of this space by the central fireplace, an idea reiterated by Harding and Gilmour (2000, 69). I doubt whether a central fire could have produced enough heat to dry the intra-mural spaces, cells and staircase in prolonged wet weather. The most recent reconstruction model is that of Mousa, Shetland, by Tanya Romankiewicz (2004, 12-13), a doctoral student in architecture at the University of Edinburgh. She has proposed a conical rafter roof with the structural frame resting on the inner wall but with the roof covering carried over the outer edge (Fig. 52). This reconstruction, with the 45° pitch carried over the outer edge, would create the same problems for thatching and maintenance discussed above. However, it does suggest that it would be possible to roof the building with a structure that rested on the internal wall, and simultaneously maintain a waterproof cover over the whole structure. I would propose that it is more likely, given the evidence summarised in section 2, that the wall-top would have been covered with turf and perhaps clay at a shallow angle, thereby massively reducing the ingress of water and making the cells and intra-mural spaces useful for storage and other functions, perhaps as sleeping quarters (Fig. 53). This reconstruction would suggest that these spaces were generally in use and, further, it would create a wall-walk with only a slight angle that would make thatching and repair much easier. In addition, I would argue that the diagnostic wall-voids found in well-preserved brochs were designed to distribute peat-smoke as well as heat and structural stress. This would be all the more necessary if there were central hearths on the broch ground floors, underneath a timber first floor. In this situation, the voids would allow the smoke to escape up the side of the building. Further, it is possible that the voids were covered by a wattle and clay canopy chimney, similar to the hingin lum of more recent vernacular buildings. Figure 53: Author's reconstruction drawing of Dun Chàrlabhaigh. Illustration shows a section from west to east through the entrance, looking north. Moving from design to use, the evidence from the artefacts recovered from brochs are indicative of the daily subsistence activities of a pastoral household, not the activities of high-status individuals concerned with personal adornment. Indications exist for corn grinding, butchery, food preparation, spinning, weaving and sewing (Parker Pearson and Sharples 1999, 348) and this, coupled with evidence for the accumulation of large midden deposits (Fairhurst 1984, 179), has ruled out explanations of function as refuges. Similarly, the reappraised evidence of broch density and distribution suggests they were not simply high-status 'castles' (Fojut 1982; Armit 1988; 1992), as proposed by an eminent scholar of the early 20th century (Childe 1935). Recent interpretations of social hierarchy have been contentious (Parker Pearson et al. 1996; 1999; Armit 1997; Gilmour and Cook 1998), although it has become more acceptable to see the Western Isles broch as a building occupied by people of varying status (Armit 2002, 24; 2003, 84). In an original analysis, I have compared broch internal areas with those of post-medieval longhouses, an examination that suggests that those brochs with smaller diameters may have functioned as single-family farmsteads, although the status of the family may have varied. Table 5 shows that the average internal area of Western Isles Atlantic roundhouses may have been similar to the post-medieval Lewisian blackhouse  a large building that contained a domestic area, a byre, and a barn, but perhaps bigger than single roof blackhouses of the post-medieval period. However, those of larger diameter and those with additional floors may have had areas considerably in excess of this, and point to larger groups of people or greater use of space per individual. One caveat to this assertion may be that some structures described as Atlantic roundhouses in the NMRS (National Monuments Record of Scotland) or by Armit's distribution (1996) may be too large to have been roofed. Looking at the high density of post-medieval occupation, estimates of 2030 people living in these larger examples are perhaps possible, but certainly not up to the 50 or 80 suggested by previous scholars (Fojut 1982, 53; Armit 2003, 84). This lower estimate of numbers of broch inhabitants also suggests that they may have been relatively resource-rich, since the estimates above were based on subsistence-level populations of the late 18th century. Indeed, Branigan and Foster (2002, 131) have suggested that the occupation density per building in the post-medieval period is actually very high, when compared to global ethnographic examples. This new model, using evidence that is based not on an assumption that the population and economy has remained at subsistence level for millennia, but rather that individual space in the home may have remained similar, can give markedly different results. Other attempts to understand the use of space include that of Reid (1989), who has suggested that the wheelhouses and brochs can be seen to incorporate similar spatial arrangements, and Hingley (1990), who has proposed a distinction between central and peripheral zones in Iron Age roundhouses. Importantly, the radial pattern definitive in wheelhouses is present in many of the brochs of the Northern Isles, such as Howe (Ballin Smith 1994) and Bu (Hedges 1987) and in the Western Isles could have been formed by wattle panels, difficult to locate in the often disrupted broch interior. Reid (1989, 10-11) had suggested that they may have been sleeping places but evidence from wheelhouses has pointed to the focus of specific domestic activities in equally specific parts of the house. 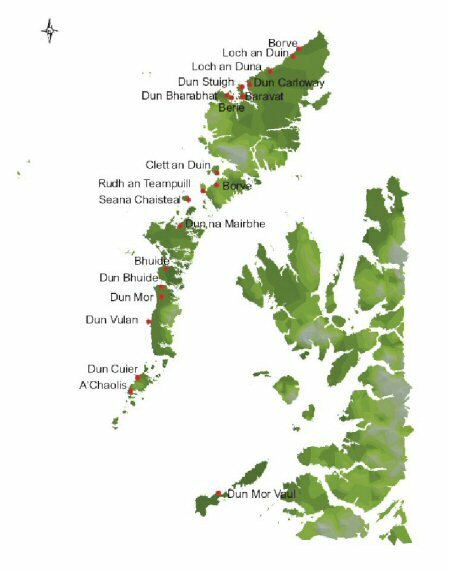 As mentioned in section 2, the association of the blackhouse with the accumulation of manure and the over-wintering of stock can be seen as an important element within the 'cognitive map' of people in the Western Isles of the 2nd millennium AD. Similarly, the association of the wheelhouses with the fertile machair and the brochs with extensive midden deposits can be seen as a similar attempt to reinforce aspects of fertility through the architecture of the buildings (Parker Pearson and Sharples 1999, 17). At Dùn Vulan broch, South Uist, excavations also uncovered a large midden deposit built against the wall of the broch, and interpreted as a sign of status and wealth (Parker Pearson and Sharples 1999, 348). The dominant vernacular forms of the Middle Iron Age, brochs and wheelhouses, incorporate similar organisation of space with a central domestic area around the hearth, and another area within the piers of wheelhouses, the cells of brochs and perhaps ancillary buildings. The insubstantial evidence for organic materials suggests these buildings may have had relatively similar roof structures to later ones in terms of both design and materials and, further, that elements of their design suggest continuity within the area rather than dramatic change. This section has presented a summary and critique of the evidence for vernacular buildings in the Western Isles back to around 300 BC. In this, I have shown where I think comparisons can be drawn between earlier buildings and those of the post-medieval period. The final section in this article puts forward a revised understanding of Hebridean vernacular buildings where they are seen as part of a long-standing traditional vernacular heritage.